Actin is a globular, roughly 42-kDa moonlighting protein found in all eukaryotic cells (the only known exception being nematode sperm) where it may be present at concentrations of over 100 uM. It is also one of the most highly-conserved proteins, differing by no more than 20% in species as diverse as algae and humans. Actin is the monomeric subunit of two types of filaments in cells: microfilaments, one of the three major components of the cytoskeleton, and thin filaments, part of the contractile apparatus in muscle cells. Thus, actin participates in many important cellular processes including muscle contraction, cell motility, cell division and cytokinesis, vesicle and organelle movement, cell signaling, and the establishment and maintenance of cell junctions and cell shape. Many of these processes are mediated by extensive and intimate interactions of actin with cellular membranes. In vertebrates, three main groups of actin isoforms, alpha, beta, and gamma have been identified. The alpha actins are found in muscle tissues and are a major constituent of the contractile apparatus. The beta and gamma actins co-exist in most cell types as components of the cytoskeleton, and as mediators of internal cell motility. 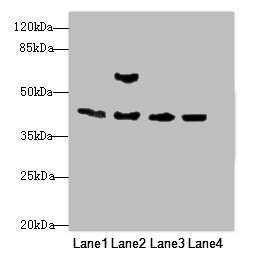 Acta1 Polyclonal Antibody. Unconjugated. Raised in: Rabbit.